A convicted drug baron wanted in Australia appeared in an Athens court awaiting trial on charges of possessing a false passport. 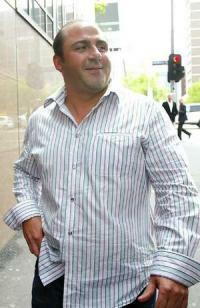 Tony Mokbel , one of Australia's most wanted men, said he would fight an extradition request, fearing unfair treatment in Australian courts. The court delayed reaching a verdict until June 22, pending further information from the Greek police. Asked if he had committed murder, Mokbel replied: "110 percent no." Mokbel, 41, was arrested Tuesday in a seaside Athens suburb on an international warrant following cooperation between Greek and Australian police. He had fled his country in March 2006 during his trial on charges of drugs trafficking. He was later convicted in absentia of cocaine trafficking and sentenced to at least nine years in prison. If the Greek court convicts him of possessing a forged passport and driving license both misdemeanors he faces a maximum 12-month sentence. Sitting in a courtroom with his girlfriend, baby daughter and 11-year-old stepdaughter, Mokbel said he would fight extradition "one hundred percent." "I've been told that I have a very good chance (of success)," he said. "I don't think I'll get a fair go in Australia." But he said he did not fear for his life in Australia "because I've done nothing wrong." Mokbel said Greek Prime Minister Costas Karamanlis' visit to Australia last month could have precipitated his arrest. "There may be a political connection, because I've been told that the Greek and Australian prime ministers met recently," he said. Greek judges are now awaiting further documentation from the Australian courts, detailing the charges against him before the extradition procedure is formally started. Greek Police Chief Lt. Gen. Anastassios Dimoshakis said Greek authorities were investigating whether Mokbel was trying to set up a drug trafficking network here, but insisted the probe would not impede the extradition process. "From the moment the extradition request reaches the competent judicial authorities, it takes about 45 days for the process to be executed," Dimoshakis said. "Everything is being done so that we reach that day that we can hand over the arrested man to Australian authorities on the stairs of the airplane at Athens International Airport." Australian Federal Police Commissioner Mick Keelty, visiting Athens, said he expected Greece and Australia to sign a permanent police cooperation agreement soon. "We thank the senior officers of the Hellenic Police for the work they have done in capturing a most important fugitive for Australia," Keelty said. He added: "We don't anticipate any problems ... The extradition process is already underway." He said the relationship between the police of Australia and Greece should be improved "to ensure that nobody is abusing our criminal justice system in either of countries." Australian Federal Police said the international warrant was based on four Australian warrants: For the alleged importation of 2.9 kilograms (6.4 pounds) of cocaine, the alleged ordering of 100 kilograms (220 pounds) of amphetamine and another substance from Europe, three counts of trafficking drugs, and the murder of underworld figure Lewis Moran.